If you or someone you know is experiencing suicidal thoughts or behaviors please call 1-800-273-TALK(8255) or go to your nearest emergency room. We know that an early diagnosis of bipolar disorder is often uncertain. Bipolar disorder causes extreme shifts in mood, energy and daily life functions. There can be other psychiatric disorders such as anxiety, panic disorder and substance abuse to complicate diagnosis and treatment. This can be very frightening for the person with bipolar disorder and those who love them. But the greatest risk of bipolar is no treatment! The National Alliance on Mental Illness (NAMI) reports that only half of all people with bipolar disorder receive treatment. This raises the risk factors, particularly for suicide. With diagnosis there is treatment with durable management and recovery from symptoms and a very real possibility of a full and productive life. Treatment typically includes a combination of medication, therapy, stress management, skills training, attention to lifestyle and a support network. We urge you to seek diagnosis and treatment for yourself or your friends or family members if needed. There is a great document available on the NAMI website: Understanding Bipolar Disorder and Recovery. There are many resources available. We encourage you to become familiar with these and learn more about bipolar disorder. We want anyone with bipolar disorder to be the strongest voice in their own treatment plan! www.nami.org: National Alliance on Mental Illness, a great place to start when looking for information, help, and support. www.nimh.nih.gov: National Institute of Mental Health, a wonderful source for current research and studies surrounding mental disorders. This site aims to “transform the understanding and treatment of mental illness through research”. www.narsad.org The National Alliance for Research on Schizophrenia and Depression is the worlds leading charity dedicated to the research of mental health. The site provides information about psychiatric illnesses, support groups, local mental health organizations, and provides educational materials on request. www.dbsalliance.org Depression and Bipolar Support Alliance provides almost everything you need to know about depression and bipolar. www.dbsalliance.org: (Depression and Bipolar Support Alliance) Almost everything you need to know about depression and bipolar. www.afsp.org: (American Foundation for Suicide Prevention). us.reachout.com Reach Out is an information and support service using evidence based principles and technology to help teens and young adults struggling with mental health issues. Audio and video stories share personal experiences with mental health issues from teens and young adults and how they got through those issues. www.transitionyear.org/ Transition Year is an online resource center to help parents and students focus on emotional health before, during and after the college transition. www.whatadifference.samhsa.gov A chat site for young adults living with mental health problems and to friends of those living with mental health problems. The forums provide a means to share experiences, ask questions and find answers. www.thebalancedmind.org (Child and Adolescent Bipolar Foundation) Covers information about the illness, including education and legal issues. The site provides message boards, chat rooms, and support groups for parents and young adults. www.karlasmithfoundation.org KSF believes there is hope for a balanced life. Even if there is an untreated person with mental illness in the family, even in the aftermath of suicide, there is hope. KSF helps discover and nurture that hope. www.ffcmh.org The National Federation of Families for Children’s Mental Health is a national family-run organization linking more than 120 chapters and state organizations focused on the issues of children and youth with emotional, behavioral, or mental health needs and their families. www.wellsphere.com One of Linea’s most frequented sites. Has a community where you can get information, ask questions, or simply build a profile and interact with other consumers with similar health goals. Visit Linea’s profile here (http://www.wellsphere.com/linea-profile/119590 ). www.facingus.org A fun and extremely site, in which you can track your moods, journal, get tips on how to find a happy and healthy life, and build a wellness plan to help you accomplish that goal. www.dailystrength.org This site has online support groups for everything from mental health to personal challenges. www.aa.org The online site for Alcoholics Anonymous for anyone dealing with self-medication induced alcoholism. www.draonline.org (Dual Recovery Anonymous) Recovery and support group for those with both a mental or emotional disorders and a drug addiction. www.projecttransition.com Apartment-based communities that support adults suffering from psychiatric problems that have been recurrent. It has many resources on helpful organizations, treatment programs, and educational articles. tip.fmhi.usf.edu (Transition to Independent Process) Organization devoted to helping youth with mental and/or behavioral problems transition to adulthood smoothly and safely. www.bringchange2mind.org A mental health awareness campaign started by Glenn Close and her sister Jessie who are working to fight stigma and change the vocabulary surrounding mental illness. www.cartercenter.org/health/mental_health/index.html Under the leadership of former First Lady Rosalynn Carter, the nation’s foremost champion for the rights of people with mental illnesses, the Carter Center’s Mental Health Program works to promote awareness about mental health issues, reduce stigma and discrimination against those with mental illnesses, and achieve greater parity for mental health in the U.S. health care system. www.mindsontheedge.org Minds on the Edge: Facing Mental Illness provides a link to an excellent video seminar that discusses recovery and solutions to the mistreatment, misrepresentation, and misunderstanding of those suffering with a mental health condition. It also provides a place to share your story and information on how to get involved with the Minds on the Edge movement. www.theicarusproject.net The Icarus Project is one of Linea’s personal favorites. A wonderful community in which people can share stories, questions, and art relating to their life and “illness.” This has great resources for those of you who are focused on alternative forms of medication. www.everyminute.org Every Minute is an organization focused on “accelerating mental health research” by educating people about suicide and mental health. This is a wonderful site for advocacy and has all the latest updates on any news relating to these issues. An Unquiet Mind: A Memoir of Moods and Madness by Kay Redfield Jamison (Paperback – Jan 14, 1997). This is a classic and written by a psychiatrist with bipolar disorder. This is the first book Cinda read about bipolar disorder. Crazy: A Father’s Search through America’s Mental Health Madness, Pete Earley. Veteran Journalist Pete Earley explores the interconnection between mental illness in America and the criminal justice system. Not only educational for anyone wanting to know more about the system but extremely personal and loving as he tells the story of his own son’s struggles. Within our Reach, Rosalynn Carter with Susan K. Golant and Kathryn E. Cade. Former First Lady Carter and her colleagues provide an assessment of the state of mental health. This is a favorite of both Linea’s and Cinda’s in providing a well-written overview and gives insight to issues facing us all and ultimately hope for a better future. Madness: A Bipolar Life, Marya Hornbacher. 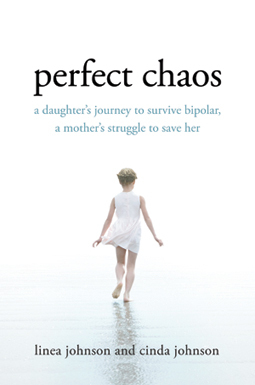 A passionate and intense memoir of one woman’s journey with bipolar disorder. Marya’s honest words and powerful voice really allow people to see a glimpse into the life of a woman who experienced rapid cycling bipolar from a very young age. Detour: My Bipolar Roadtrip, Lizzie Simon. One young woman’s journey to better understand herself and her new diagnosis of bipolar disorder. The story brings in other voices and lives as Lizzie attempts to grasp this intangible illness. The Van Gogh Blues: The Creative Person’s Path through Depression, Eric Maisel (Paperback – Dec 28, 2007). Since we are all artists in our family this is one that Cinda likes very much. Mind Race: A Firsthand Account of One Teenager’s Experience with Bipolar Disorder (Adolescent Mental Health Initiative), Patrick E. Jamieson and Moira A. Rynn (Paperback – Aug 15, 2006). This is a wonderful book for teenagers, young adults, parents and educational professionals. Linea said that the first ten pages describe her feelings so accurately. The Bipolar Teen: What You Can Do to Help Your Child and Your Family, David J. Miklowitz and Elizabeth L. George (Paperback – Nov 15, 2007). Teens may not find this too interesting but it is a good resource for parents and teachers. How I Stayed Alive When My Brain Was Trying to Kill Me: One Person’s Guide to Suicide Prevention, Susan Rose Blauner (Paperback- June 30, 2003). A great book for anyone who has experienced or is experiencing suicidal thoughts. Provides great skills and resources to help one cope with the agony and horror of suicide. Nothing Was the Same, Kay Redfield Jamison. A beautifully written book that helps understand the difference between grief and depression and also is a true love story. Unlisted, Delaney Ruston, www.unlistedfilm.com A film following filmmaker Delaney Ruston as she reconnects with her father after years of separation through her choice to be “unlisted” in the phone book. Very inspiring and shows the importance of family in times of mental instability. Minds on the Edge, Fred Friendly Seminars, www.mindsontheedge.org. A roundtable discussion of the many intricacies of living with a mental illness. With topics ranging from access, to family, to the criminal justice world this seminar will give anyone a beginning understanding of the scope of the mental health world and its many topics.